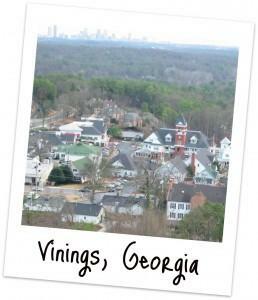 Vinings is a city located in the suburbs just 10 miles northwest of Atlanta. The city is one of Cobb County’s most sought after locations. Vinings is located along the Chattahoochee River and is a city with southern charm. The city has the pleasant mix of southern attraction and current sophistication giving it a feeling of New South. According to the 2010 census, Vinings has 9,734 residents. Vinings was first known as Crossroads and then in 1830 it was known as Paces. The name Paces came from the man Hardy Pace who operated a Ferry company transporting residents across the river. The name Vinings was coined for William H. Vining who worked on the railroad construction of a bridge. This name came about when the area became a construction stop for the railroad. Vinings is a city that residents love and other people wish to reside in. The city has an excellent school system as well as beautiful homes. Vinings also has low taxes in the city which is a main reason that people tend to move into the city. The beauty coming from the Chattahoochee River is another attractive quality of the city. The residents of the city also value the festivals, parades, carnivals and other community events that take place in Vinings. The city has a sense of pride for where they live and Van Sant Law, is proud to represent the residents of the city. Our firm is a qualified personal injury firm with years of experience in helping clients receive compensation for their injuries. The Alpharetta personal injury attorneys at our firm strive to be compassionate and aggressive lawyers for people suffering from injuries. David Van Sant is the founder of the firm and is a well- known and recognized personal injury lawyer in Alpharetta. He has received a 10.0 Avvo Rating and is the recipient of the Avvo Client’s Choice Award. The way to earn these awards are through ratings from previous clients which shows the positive feedback he has gotten from real people that he has represented. Attorney Van Sant has also been voted a Super Lawyers® Rising Star℠ and he is members of two prestigious groups of trial lawyers in the United States. Our firm has recovered millions of dollars in settlements for clients. The only way to be a member of the Million Dollar Advocates Forum® & the Multi-Million Dollar Advocates Forum® is to have recovered verdicts for millions on behalf of their clients and our firm has done that. Suffering from an injury can be an overwhelming and emotionally traumatic time. Our attorneys aim to be understanding and help in any way possible. In order to better your chances for receiving the maximum compensation for your injuries, team up with a Vinings personal injury lawyer from our firm. We do all that we can to make sure the responsible party is held responsible for their actions. Looking for a Lawyer for a Personal Injury Case in Vinings, Georgia? Van Sant Law, has four offices throughout the state of Georgia and one just a few miles outside of Vinings. If you have been injured in an accident or suffering from an injury due to the negligence of another person, contact our firm right away. You can contact our main office at 678-679-6710 or visit our firm at 3525 Piedmont Road NE #300 Atlanta, Georgia 30305. The Alpharetta personal injury lawyers at our firm offer a free case evaluation for all residents of Vinings. You are able to ask questions and discuss your case along with the options that you have with a skilled attorney at no cost to you!